A while back I was doing a search for something and as searches go I got side-tracked and ended up here at The Museum of Anti-Alcohol Posters web site. This great collection from the Soviet propaganda era belongs to Yuri Matrosovich of Moscow, Russia. These wonderful posters use limited color and simple, bold shapes to get their message out. During this era, Constructivism (a geometric abstract art movement in Russia) design was heavily used in commercial art. Constructivism was influenced by Bauhaus in Germany, De Stijl in the Netherlands and Abstraction-Creation in France. Yuri has kindly accepted my invitation for a interview and below is a bit about him and his collection. Tell me about yourself. Are you an artist, designer, photographer, etc.? I am designer and dilettante (as in hobby) photographer. What inspired you to start collecting these posters? Actually I just happened to lay a hand on a small propaganda pack of anti-alcohol society. We had one in the Perestroika era. Here’s the badge of this society. 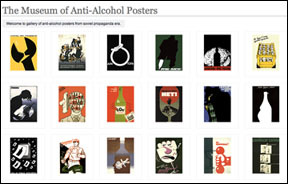 Later I started to collect anti-alcohol posters and as soon as I started developing websites I decided to put my small collection online. I can’t pick out just one: I think every third poster in my collection is a treasure (also some of posters unfortunately is slapdash). Do you have any stories about any of the posters? Nothing really special, just usual stuff: small classic car replicas, interesting coins, etc. What inspires you? Some people are inspired by music, nature, loved ones, animals, color combinations, etc. I think traveling and sightseeing inspires me most. When you are unmotivated what types of things do you do to get yourself motivated? Nothing, really. If there’s a thing I don’t want to do but I have to, I just do it. And if I don’t want to do something I can avoid, I just don’t do it until I am motivited somehow. Is there a person who has inspired you at some point in your life (relative, friend, etc.)? I don’t really know, what it means: everyone is affected by someone every time. When you were a child, what was your favorite game to play? I believe it was some kind of Lego. Please visit Yuri’s other site. He can be reached on Facebook as well. The Opte Project was started by Barrett Lyon, who on a bet, challenged that he could write a program that can map the entire net in a single day. His visual representations of the internet’s backbones are truly amazing. Visit his site to see other examples. (thank you Digi for sharing this).